Along with colorful autumn leaves, fall brings sneezes and runny eyes to many of us. For some, fall allergies are more bothersome than spring allergies. The primary culprits causing fall allergies are pollen, molds, and dust mites. But don’t just suffer! There are steps you can take to minimize allergic reactions. Ragweed pollen causes more allergic reactions than anything else during fall months. (These reactions are often called “hay fever” despite their having nothing to do with hay and do not cause a fever.) If you are allergic to pollen during the spring, you have about a 75% chance of also reacting to ragweed. During warm days and cool nights in August through October, wind scatters the pollen nearly everywhere in North America. Pollen levels peak around midday and especially during warm, dry weather. Although rain removes the pollen from the air, dry winds can spread it for hundreds of miles. Inhaling ragweed pollen can result in allergic rhinitis—a condition that produces runny nose and eyes and causes sneezing. 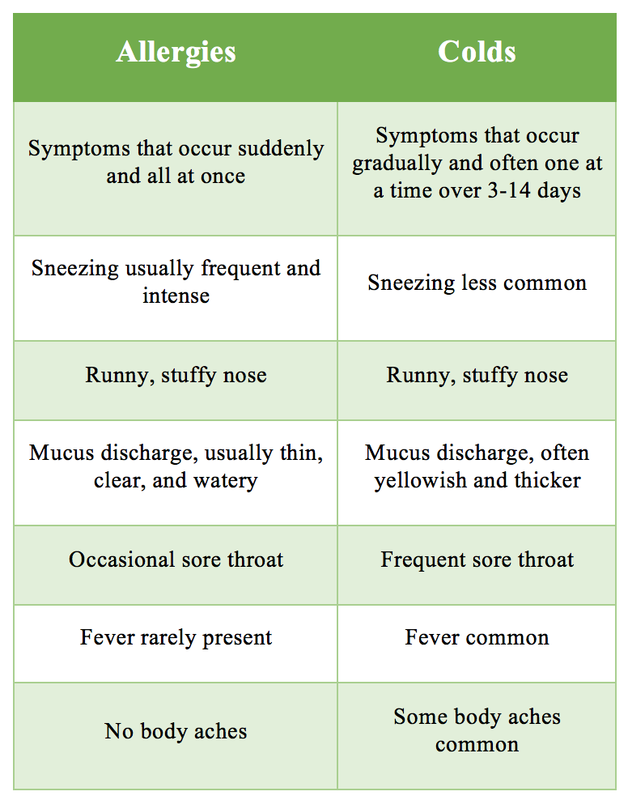 Some symptoms resemble those of a cold. The pollen can also be ingested when certain foods are eaten raw. Bananas, melons, cucumbers, zucchini, beans, celery, and some fruits often carry ragweed pollen. Cooking usually removes the problem, but not always. Orally ingested pollen can result in swollen mouth and throats as well as, rarely, vomiting, diarrhea, or even anaphylactic shock. Molds are another major trigger of fall allergies. Most of us are aware that molds grow in warm, damp places in our homes. But during the fall, those piles of autumn leaves that kids like to jump in are usually filled with mold spores. The spores can be kicked up by autumn winds or by raking. Even walking through the woods or a park where leaves have fallen can expose you to mold spores. Symptoms resemble those caused by ragweed and can sometimes be severe. Dust mites present a third fall allergy trigger. They are too small to see without a microscope and are difficult to control. Although they live and are active year-round, turning on our heating systems in the fall forces dust and the residue from the mites into the air. Since dust mites feed on the dead scales of human skin, we encounter them most often in bedding, carpeting, and upholstered furniture. Symptoms, again, resemble those produced by ragweed. Many of us have trouble determining whether we’re suffering from a cold or an allergic reaction, especially since some of the symptoms are similar. Remember, though, that allergies are caused by allergens—substances that trigger an autoimmune response in our bodies—while colds are caused by viruses. The following chart can help you distinguish them. 1. Reduce exposure to ragweed and other pollens. If possible, keep windows closed and remain indoors. Use air conditioning to filter the air and change or clean filters monthly. Be especially careful on dry, windy days. 2. If you are allergic to molds, avoid raking leaves. If you must rake or blow leaves, wear a NIOSH-rated N95mask. Also avoid walking in the woods or other places where leaves have fallen. 3. Control the presence of dust mites. a. Encase your mattress and pillows in allergen-proof covers (available online and in many bedding or department stores). b. Wash all bedding weekly in hot (at least 130ºF) water and dry on high heat. c. Replace wall-to-wall carpeting with non-fabric flooring. d. Remove as much upholstered furniture as possible. e. Vacuum with double-layered microfilter bag or HEPA filter installed. f. Use damp mop or rag to remove dust (dry rags merely stir up allergens). 5. To ease symptoms, consider the following medications. a. Antihistamines (available in pills, liquids, or nasal sprays; Benadryl™, Zyrtec™, Allegra™) to reduce runny nose, nasal congestion, and sneezing. b. Nasal corticosteroids (Flonase™, Nasonex™) for reducing all symptoms and blocking allergic reactions. Best if begun before symptoms emerge. May have side effects. c. Leukotriene receptor antagonists (Monteleukast™) useful in treating asthma and blocking effects of allergens. d. Decongestants (in spray, pills, or liquids) for relieving nasal stuffiness; can have unwanted side effects for persons with high blood pressure and might cause drowsiness. 6. In instances of severe or chronic allergic reaction, it might be necessary to receive allergy shots (subcutaneous immunotherapy, or SCIT). This should be handled by a physician or allergist who can conduct appropriate testing to identify the specific allergen that is causing the reaction. Note: It is wise to consult a health care provider when using any medication. Remember also that children returning to school in the fall often encounter high levels of allergens. School buildings that have been unused during summer months are usually filled with dust and mites—major allergy triggers. Be sure to monitor your children’s health during these months. Managing fall allergies can be tricky. At Kathy’s Urgent Care, we can help. We’ll diagnose your situation, offer tips for controlling exposure to allergens, and prescribe the correct medications to help relieve your symptoms. Remember: No appointment is needed! Just walk in, 7 days a week, and we’ll help you feel better. Newer PostGet Your Flu Shot Now!